Okay. It’s been seven days. I think I am emotionally ready to talk about the drama of last weekend. Instead of attempting a long explanation that no one will understand I thought I would draw a couple pictures. Feel free to snicker. Here’s the scene: Saturday, April 21. Agility class. Final sequence of the day. Shiva at her most thoughtless and me tired from handling her through some tough earlier challenges. My PH is not present, making things even more difficult. At the best of times Shiva requires two people: one to keep her distracted, the other to pay attention to instructions. I had been doing both myself for over an hour. Shiva was ready to climb the walls. It took us several tries to get the tunnel entrance right. Because she’s Shiva and thus insane, she decided she wanted to enter the tunnel from the other side no matter what I did. Eventually I just gave up, grabbed her collar, and guided her in myself. This action probably riled her up more than necessary. 2. The “ack!” is Shiva stopping herself halfway over the jump because she realized I wasn’t with her. I may have called her name as well, I can’t remember. Regardless, she realized something wasn’t right and tried to correct herself. Rather than finishing her jump like a normal dog Shiva stopped herself mid-air and twisted around. This twisting while airborne caused her collar to loop over the jump standard. When she landed – dang gravity – her collar remained hooked on the standard. 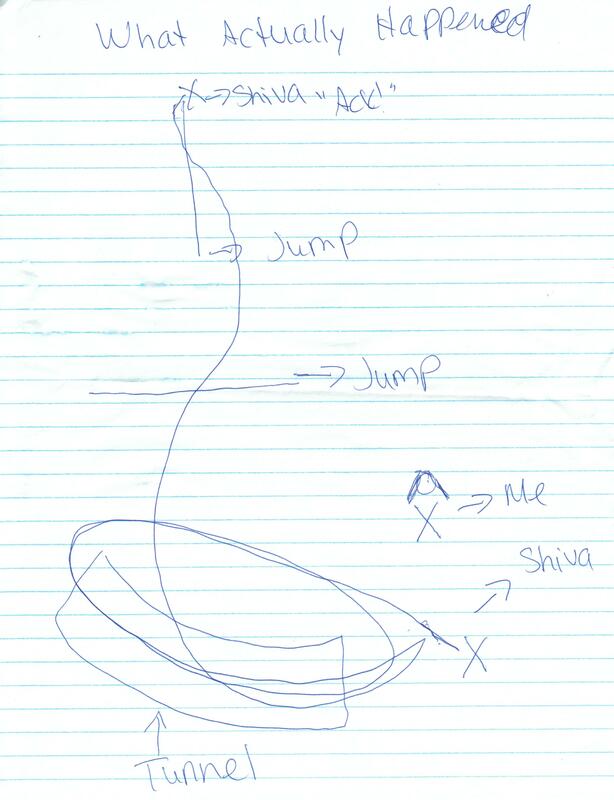 Instead of stopping, Shiva kept running, proceeding to drag the entire jump with her around the room. Funny? At first. Remember, this is Shiva and this type of thing is par for the course with her. This is the dog who regularly knocks over tire-jumps and takes the teeter backwards. Her agility antics are fairly infamous at this point. If it was any other dog, it would have been a much bigger deal. I distinctly remember rolling my eyes before walking over to help her out. However, after I took two steps, I discovered the situation wasn’t just Shiva being ridiculous. As she dragged the jump, her collar tightened around her neck. When she stopped running I realized she was having difficulty breathing. This is when things got really awful, really fast. The rest of it was a blur and I won’t go into too much detail. With the help of the instructor and fellow classmates we were able to get Shiva’s collar off and stop her from choking. I don’t know how long it took but at the time it felt like forever. Panic was definitely in my eyes. I am used to Shiva’s goofiness but I am not used to this level of fear. There was a moment when we made eye contact as Shiva made a gagging kind of sound – a sound I never want to hear again – and I was terrified for her life. Don’t worry, she’s fine. Better than fine. The very instant she was freed Shiva took advantage of our distraught states to scavenge for treats out of other people’s bags. Food obsessed to the max, she wasn’t about to let a little thing like almost choking to death prevent her from getting to the good stuff. She’s not even afraid of jumping again. Any other dog would probably hesitate before entering the agility ring once more. Not the Shivster. 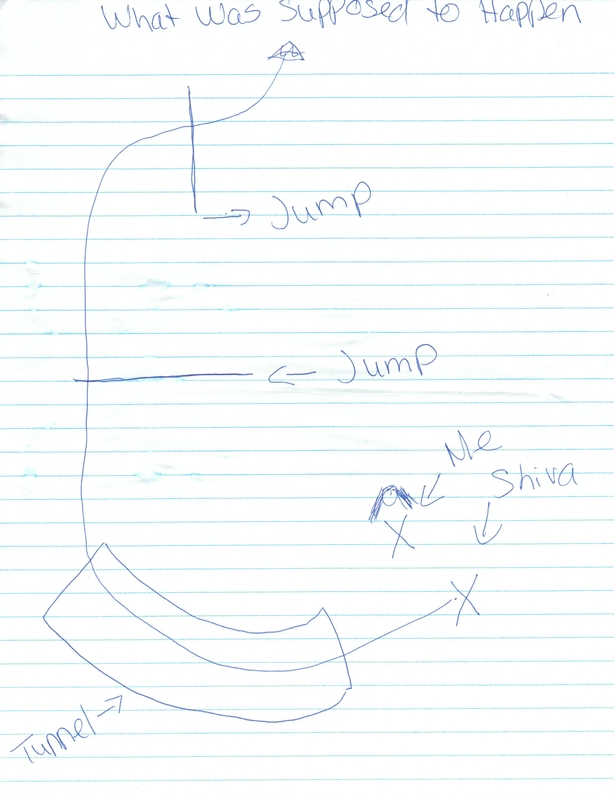 She not only willingly took the same jump five minutes later, but she ran in Sunday’s fun match with her usual verve. Once it was all over, it was like nothing had happened. For Shiva, anyway. It’s a whole different story for me. I am still worried. As I mentioned above, this kind of thing is really nothing new for Shiva. The level of danger, perhaps, but she has almost severely injured herself many times before. Shiva is not only brave, she also has zero sense of self-preservation. Those two characteristics do not go well together. I don’t think she even really feels pain. When she landed on her back after a fall from the dog walk, she jumped right up and ran back on. How long can she go on like this? How much time do we have before she breaks something? It makes me question our participation in the sport of dog agility. I can only keep her so safe. For the most part, she is out there on her own. I have to trust her to use her brain to prevent her from killing herself. Sadly, I am not sure I can do this. If that’s the case, I worry that by continuing on, I will be playing with fire. Shiva is just a dog. We are responsible for her health and safety. If a bad accident happens out on the course one day, it will be my fault. I don’t know if I can live with that. I think about this one all the time. Mufaasa is pretty mellow at lot of the time, but when I do finally get him rilled up he completely looses all sense of self-preservation. But, really, there’s nothing he could do to himself in an agility ring that he couldn’t pull off walking down a trail in the woods. So, short of locking Shiva in a box and never giving her any freedom, she has the risk of hurting herself anywhere. At least this way she’s enjoying herself. Also, dog’s are waaaaay more coordinated than we give them credit, so they get out of most of the messes they get in to, and hopefully get a great life lesson out of it (like when my last dog got into a loosing argument with a porcupine). Still really they used break-away cups on agility jumps though. I am so glad she is OK. Sounds very scary. This is something that we grappled with. After Thunder bloated, we seriously though about retiring him from training and competition. To the extent that the physical exercise, or some unknown allergen in the field contributed to the bloat, we just did not want to chance a recurrence. He almost died and if we had delayed just a bit, he would not be here today. It made perfect sense right? Of course we had a six week layoff from training to think about it and when we did, we decided that we just couldn’t stop him from doing what he loved. What kind of life would that be for him? We can’t keep him in a bubble and would he even want that? It is not an easy question. If agility doesn’t work out, I am sure you will find something that you are comfortable with to challenge Shiva. Good luck. Since Mayzie doesn’t compete in agility, I can’t speak to this specifically. But here’s what I know: our dogs lives are short. Much TOO short. That’s why I think it’s important to let them get every little bit of joy out of life that they can. Of course, that doesn’t mean allowing them to run wild in a busy street. But if there are opportunities for them to do things that they love – even if it means there might be some danger associated with it – I truly believe we should allow them to do it. Believe me, I worry a LOT about EVERYTHING when it comes to my pets. But I can’t let my fear take the joy out of their lives. For instance, there are people who never take their dogs with them on errands because they’re afraid that they’ll get stolen out of their locked car. I can understand that because I worry about that, too. But frankly, both Ranger and Mayzie love it SO much that it’s a calculated risk I’ve decided to take (on cool days, of course). Sure, there’s a possibility it could happen but the probability is it won’t — and to me, the fact that the opportunity to get out of the house and go for a car ride enriches their lives outweighs that tiny possibility of what could happen. Of course, this is just my 2 cents — something to think about. You’re a great dog mom, Kristine. At the end of the day, you’ll make the decision that’s right for you AND Shiva. I’m really glad Shiva is doing okay!! Super sorry for all of the drama. You just have to make the best decision for you and Shiva. For me, I know there is risk in doing the sports I like to do with my dogs but their love of these games is worth the level of risk for me. I do everything in my power to keep them safe while we play… but they can’t live in a bubble and no one would be happy if they did live in a bubble. Have you thought about running her without a collar on or with a safety collar like this one while she’s running and take off her normal collar http://www.petexpertise.com/dog-safety/comfort-id-embroidered-dog-collar-band-with-safety-stretch.html take some time and make the best decision for you and for Shiva! I am so glad Shiva is ok. I know once Song tried to jumpt out of the car with her still clipped to the seat belt. I thought she’d broken her neck. Things happen hun and you can’t hold yourself responsible. Carry on doing the agility and enjoy it just like Shiva does. Oh my. I know how you feel. Chewy decided to leap off the top stair of a one story stair case, onto a concrete floor. Not sure what he was thinking (maybe that he would grow wings mid air?) He stood right up, but I was really worried that he could rattled his brain a bit in the process, and watched for signs of concussion. We have since put up some barriers so he can’t do that again, because I know he would! As for agility, I think it is relatively safe. You hear about “accidents”, like an a frame collapsing underneath a dog, tires being tipped over onto a dog, etc. However, I think they are rare. My dogs always tend to get hurt at home, doing normal dog things (like running). However, I do understand your fears of continuing agility. It won’t be fun for either of you if you are worried Shiva may kill herself. Hi Kristine, okay now we understand the emotion and concern behind your recent agility incident with Shiva. This sounds like it could have been a “freak accident” – perhaps you’d consider running Shiva without a collar, slipping it back on after the run. But really, accidents can happen no matter how careful you are. This incident was not something you could have foreseen or been aware of. So stop being so hard on yourself. Both the shelties went to an agility match recently and they both came back fine. Our peeps tell us that if we don’t feel like doing a dog-walk or teeter or whatever, that that’s okay and we’ll take the penalty but we’ll keep the fun too. I don’t have any of the great advice or words of wisdom that others have offered, but I can offer my support and say two things. First, in the videos of you guys doing agility Shiva looks like she is having the time of her life and it just warms my heart and brightens my day to see it. But second, whether or not you continue with agility, Shiva brings that joy and energy to everything she does, it’s obvious, and I think no matter what you decide to do Shiva is going to go through life with a bounce in her step having the time of her life. I’m sorry you guys had such an awful scare! Nothing in life is certain. Our dogs’ lives are much shorter than ours. It’s just a sad fact. We can make sure that their lives are full and enriched, though, during that time we have together. My strong bet is that you would have a lot more regrets about the things you didn’t let Shiva do that she loves than you would have about keeping her “safe.” Live a life with Shiva so that there are no regrets in the end, just happy memories. I second Tena’s advice: Run Shiva Naked (collarless). At Elli’s lure coursing event, the huntmaster asked if I wanted to run her with a collar or without, when I said without, she said: It’s safer. I couldn’t imagine why at the time, but as I marinated on the comment on the way home, I thought of several ways something that is meant to keep her safe (via identification) might actually become a hazard during coursing. One situation being that if she fell on the line the lure is pulled by around the course (it crosses over itself several times), her tags might get caught and she’d freak out and, no doubt, harm herself. i can’t guarantee I’d be able to free her in time — the field is much bigger than you’d think. I’d also recommend more handling exercises! Just as much as she needs to learn to use her brain on the course and not be so high she can’t think straight, you need to learn to be quick enough to prevent mistakes that could be dangerous to her. Sometimes it’s easy to forget that it’s a team sport: agility. Keep your head up! Holy smokes, Kristine. How scary. Thank goodness Shiva was alright!! As I was reading this post, I kept thinking how hard it would be to get back out there. I’m a HUGE worrier in general, and I tend to panic about every little thing related to the dogs, but I also believe you’ll know what’s best for you and for Shiva. Keep us posted! Wow! I’m glad to hear she’s okay! And better yet, that she didn’t take any of the experience with her and is able to continue with agility. I like 2 Brown Dawgs’ comment – if she loves it – and you generally love it too – these experiences can be learned from to improve the future, rather than being a reason to abandon it altogether. Get back on the horse, as they say. No idea who “they” is. oh my gosh, that sounds pretty scary. so glad to hear that shiva is OK. i understand your issues with a dog that seems to have no sense of the fact that it can get hurt/killed, and i completely understand your inclination to back off of agility after looking at all the incidents and the possibilities of what might happen. some folks are pointing out that there’s only so much we can do and you have to find a balance between safety and fun–which i agree with–but as someone who is very paranoid/nervous and can’t relax when i feel like something’s off, i would say that if you’re uneasy about going back or keeping it with it long term, then it’s probably best to take a break. don’t look at it as quitting, just a break. you can explore other options for shiva. she’s so animated and shiva-y about everything, you probably won’t have a hard time finding something else she will enjoy the heck out of. you can always go back to agility later–no one can stop you. you just have to do what you feel most comfortable with. chances are, even if that means taking a step back for now, you’ll get back to it full-speed later on. Glad to hear the Shiva is okay and that you are recovering. Smokey once jumped out a second story window onto our driveway (because we were out there calling for Moree). We thought he was going to hit his head on the hood of our car. Luckily, he missed it, and the only injury was that he bit his lip a little bit- no damage to his legs or anything. There are things we can control and things we can’t. This is as true for ourselves as it is for our dogs. If you hurt yourself while running, would your PH ask you to never run again? Take reasonable precautions. I agree with the running Shiva without a collar or with a safety collar. (We know lots of dogs who don’t wear collars at the dog park for safety reasons.) But don’t let one accident scare you away from the joy that doing agility brings to you and Shiva. I can understand why it took many days to be able to relive this horrible experience. Shiva’s dog memory has kicked in and dogs often don’t learn from experiences like humans do. But giving up agility which you both enjoy seems a little extreme although I definitely understand why you feel this way right now. I agree with the idea of taking a break for a while so that you can forget the terror of a few minutes and remember the fun of the many hours. Oh goodness, how scary that would have been! I can totally understand how you feel. As always, I’m sure the answer lies in Shiva and she will tell you if it’s time to take a step back. She is wise. So so wise. I hope you find your confidence very soon. We’re all rooting for you. Accidents happen, and all you can do is learn from them. Run her without a collar, invest in a breakaway collar, invest in scissors, or see if your agility club can modify the jump. To fuel your panic, have you ever seen footage of tyre jump accidents? Breaking tyres need to be more common, too! An accident is an unforseen or unplanned event or circumstance – and unless you have done something to purposly cause the accident – there is no blame. Blaming yourself is a human response – but unless you wrap Shiva in cotton wool and never let her experience the big bad world – stuff sometimes happen. As a dog owner your job is to mitigate risk – but like they say – accidents happen. Look at her collar – can it be tighter? Look at the course before you let Shiva compete – is there an accident waiting to happen – if so – bring it to the attention of the course officials. My last thought would be is calculate the risk – and the rewards. If what Shiva gets out of agility has more positives than negatives – you take the risk – and learn from what has happened to make the experience safer for you and Shiva. If the negatives outway the positives – then it is time to find another way to spend quality time with Shiva – find different ways to give your dog joy – which is mostly spending one on one time with her people. That does sound scary. I hope that you figure out what is best for both of you. That’s so scary! Shiva wasn’t freaked out by the experience, which is pretty amazing, so I’d lean towards continuing in agility. Duke couldn’t even make it through an agility class right now, as he shuts down due to his fear issues, so I’m definitely not biased towards the sport! I agree with Annie’s idea of balancing the risks and rewards and Tegan’s ideas about collar options. Oh Kristine, I’m so sorry to hear this. No wonder it took you a while to share the story. Shiva reminds me so much of Delilah, once I saw her run UP a rock that was almost strait up, apparently she thinks she is part mountain goat. I’d really hate to see you guys stop doing agility – you’re both learning so much and Shiva does seem to be having a blast doing it. While I’m sure it was terrifying, I can’t imagine that there is a good chance this incident will be repeated. It seems like just a fluke. Perhaps the lesson in this is that when you’ve had enough, it’s time to be done? It sounds like you were pretty fried after more than an hour. Giving yourself permission to sit out the last run of the day would probably have made it more enjoyable for you. Hang in there – you guys have come so far! Okay, all your more recent post made me crazy to find this one… and I agree with the “get back on the horse” comment (which I already know you decided because I read the May 1 post before this one). Yes, it’s scary when bad things happen, but everything is a learning experience, and maybe even *Shiva* learned not stop a jump in mid-air! You’ve been experimenting with pushing comfort zones too long to stop now! I think anything fun and exciting (for us or our dogs) can have risks. It’s hard to get over something as scary as what you went thru 😦 I’m so glad Shiva seemed unaffected by it – but that doesn’t make it any easier for you! I’m off to read your next post . .I had to come read this one first . .I’m just a little behind! and located that it is truly informative. I am gonna watch out for brussels.